Gagarin anniversary: Are manned missions a waste of space? 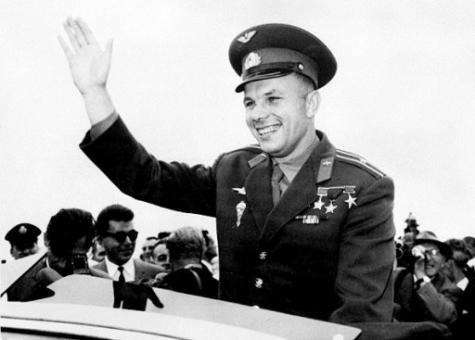 First cosmonaut in history Yuri Gagarin, pictured saluting the crowd upon his arrival in London, in July 1961 during an official visit to the UK. On Tuesday, the world will be awash with talk of courage and vision as it looks back on 50 years of manned space flight, a trail blazed by Gagarin's 108-minute trip around the planet. On Tuesday, the world will be awash with talk of courage and vision as it looks back on 50 years of manned space flight, a trail blazed by Yuri Gagarin's 108-minute trip around the planet. But what if the past half-century has been just a cosmic waste of money? Presidents and space agencies insist manned missions will always be at the heart of their space programmes. An astronaut not only embodies the human quest to explore, they argue. He or she can also act on tuition and think swiftly and creatively in ways impossible for a machine. Dissidents dismiss this as a craving for prestige, or lobbying by the space industry or astronauts themselves. Manned space flight, they contend, has sapped funds for robot probes and satellites that unlock more knowledge and practical advantages at a lower price -- and put no-one's life at risk. "People get so excited about manned flight they don't start thinking about what benefit it brings," said Gerard DeGroot, a professor of history at Scotland's University of St. Andrews. "Aside from the excitement, it doesn't actually affect our lives." Each day, the International Space Station (ISS) retreads Gagarin's path in low Earth orbit. At the same time, unheralded scouts are sending home data about the mysteries of Saturn, Mars, Venus, Mercury and the Sun or race to a distant rendezvous with a comet or asteroid. And at home, an army of satellites give us Internet and cheap phone calls, provide airliners and cars with onboard navigation and shower scientists with data about weather systems and Earth's environmental health. "None of these advantages came from manned flight," said DeGroot, author of "Dark Side of the Moon," an iconoclastic account of the Apollo programme. Contrarians say Apollo starkly showed that sending a human in space was dangerous, requiring a feat of engineering just to keep him alive and get him home safely. It demonstrated that the Moon was a deeply hostile place and our primitive chemical rockets would never get us to Jupiter, let alone the stars. And above all, it showed just how astronomically costly manned space flight is. "One thing that I think no-one realised, even as late as 1961, is that human spaceflight is enormously expensive. It's something that President Kennedy only realised after his announcement of the Apollo programme in May 1961," said Cathleen Lewis, curator at the Smithsonian National Air and Space Museum in Washington. "The continuing drive to send humans into space remains among human beings, it's beyond question. But finding ways to do it which is not that expensive is very, very difficult." The ISS, gathering the United States, Russia, Japan, Canada and Europe, carries a price tag of 100 billion dollars, by some estimates. As for a return to the Moon and venturing on to Mars, politicians may like to sound the rhetoric -- but they are less keen about signing the cheques. Francis Rocard, a specialist in Solar System exploration at France's National Centre of Space Studies (CNES), says the 25-billion-dollar cost in 1969 terms of Apollo would be around 165 billion dollars today. "Getting (a human) to Mars would be much more expensive, perhaps 200 or 300 billion (dollars). An unmanned mission, bringing soil samples back to Earth, would be between five and 10 billion," he said. By way of comparison, the Cassini-Huygens mission is exploring Saturn and its moons at a cost to US and European taxpayers of 3.25 billion dollars, while NASA's Spirit and Opportunity rovers on Mars cost 820 million dollars. The Man vs. Robot debate inspires mixed feelings among scientists, especially when it comes to the annual tussle over budgets. If the pro-robot faction derides the point of manned missions, many in its ranks quietly recognise that having a human or two carries a political benefit. A face in space stimulates public interest... and unlocks funds. "There's no bucks without Buck Rogers," as the phrase goes. Jacques Arnould, a theologian and Dominican monk who is a researcher at France's National Centre for Space Studies (CNES), said the exhilarating images returned by today's probes showed that humans could trust machines to be their eyes, ears and fingers in space. "There are more and sophisticated robot technologies around," he said. "We won't necessarily have a human being like Gagarin say 'Ah, Mars is a beautiful planet'. But there is a huge number of ways in which we can be present on worlds other than our own without physically being there." Probably, but they are damn cool. Cool counts. Funding for pure science is noble, but you want participation include people. Space is a place. Human space exploration is a necessity. Without the human component, there would be no interest in space exploration. Granted there are a select few like myself, who are interested in science for all the knowledge that it provides. But, sadly most of the public follows along with the mainstream media and lose focus on what is truly important and relevant. People will choose to watch a charlie sheen special over a robotic recording of a distant world anyday, but once you add the human aspect you gain the attention of the people and its when you have that attention that you can truly influence people. People will help fund something they feel closer to, sending more robots into space only accomplishes one thing, separating us from space exploration, when what we need to be doing is pushing ourselves more toward it. Our sun will die. Inevitable. who cares how long its going to take we should be taking precautions now, space exploration is the only way to find a solution . Manned space exploration is essential to humanity's future. Robots might be there some day, but right now they aren't even CLOSE to a substitute for the human animal.